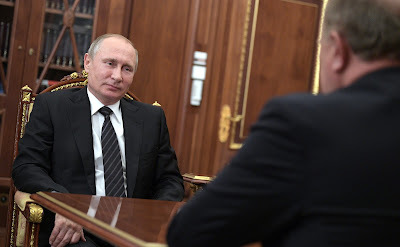 Vladimir Putin met with leader of the Russian Federation Communist Party (KPRF) faction in the State Duma Gennady Zyuganov. 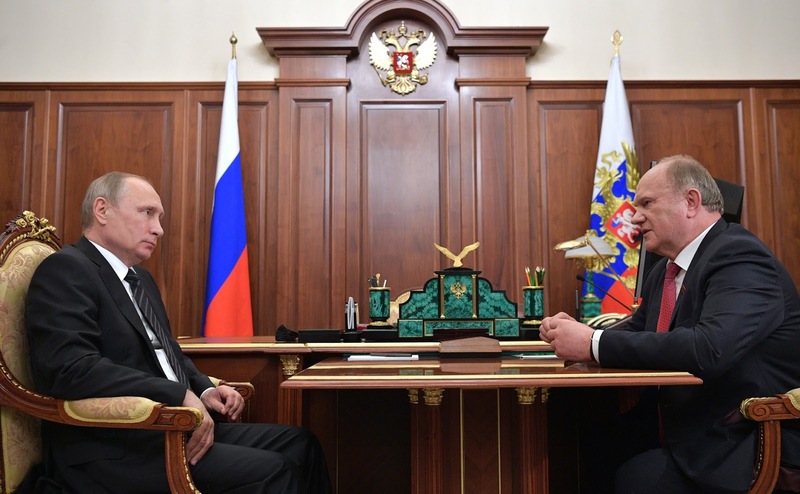 Meeting with leader of the Communist Party faction in the State Duma, Chairman of the Central Committee of the Communist Party of the Russian Federation Gennady Zyuganov. President of Russia Vladimir Putin: Mr. Zyuganov, we are meeting for one of our regular sessions to discuss your activities. As you know, I recently met with State Duma Speaker Vyacheslav Volodin and with [A Just Russia party leader] Sergei Mironov. So, it’s my turn now. Let us talk about the issues that you regard as priorities. Okay. But first I would like to congratulate you on the anniversary of Russian illegal intelligence. I saw a very interesting story. I served in a similar unit, only in military intelligence. Let us wish our special services success. We have just held a congress where a new team was elected, a strong, young and modern team. I am happy to tell you that we have prepared a practical program to move the country out of the crisis. I wanted to submit it to you; I have this document with me, our draft of the law. I believe that its implementation would greatly increase the budget revenue. We have drafted a bill we badly need now. It is called Education for All. We had the best brains working on it. You know them: Zhores Alferov, [Ivan] Melnikov, [Oleg] Smolin and [Vladimir] Kashin. We also have a gift: we have finished building Russia’s best school. Since you have declared the Decade of Childhood, I believe we should join our efforts to implement this program. Back in the early part of its history, the Soviet government saved 5 million orphans after the end of the Civil War. After the Great Patriotic War, we had 19 million children who had lost both parents or one parent – the father. Back then we created the Suvorov and Nakhimov cadet schools and also vocational schools. We have a very effective program for supporting children amid the crisis and the sanctions. What is this school you are talking about? I will present it. It is located nearby, on the Lenin Farm. It is the school of the future. We spent 1.5 billion rubles of our own funds on it. It has a kindergarten and a unique children’s park based on Pushkin’s fairy tales. It’s fantastic! I suggest that you hold a meeting of the State Council or its presidium there. By the way, the farm is doing very well, producing 10,000 liters of milk per cow and growing strawberries. The average salary at the farm is 77,000 rubles. This is a very interesting experience. Vladimir Putin: Thank you for the honey. Gennady Zyuganov: The farm also has the best orchards in the country, with 150 varieties of apples that grow in central Russia and some 50 kinds of fruits. They have pear trees and fruit bushes, and everything there is in an ideal condition. You should see it; it is very interesting. Our Zvenigovsky Farm in the Republic of Mari El has been declared the best in Europe. We presented 32 types of meat products, anonymously numbered, at the Messe Frankfurt trade fair, and they won 25 gold medals, seven silver medals and the cup. When the Germans saw that these products came from Russia, and worse still, from the Communists, they were shocked. This farm has paid over 1 billion rubles in taxes alone. It produces about 13–14 billion rubles worth of products. The farm sells them from Udmurtia to the Ulyanovsk Region and owns 500 shops. The products are made to Soviet-era standards and sell out within minutes because the quality is superb. We have established a similar farm in the Irkutsk Region, and it has also become one of the best. Governor Levchenko has met with Chinese leaders, and they signed four new programs, including in tourism. We have a program for celebrating the 100th anniversary of the Great October Revolution. We are grateful to you for establishing the organizing committee for this event. We joined forces with Moscow University Rector Viktor Sadovnichy to hold a large conference about this date at the university. The leaders of all the left-wing patriotic parties, and there are over 150 of them, have asked us to host the celebrations. We have plans for three-day celebrations in St Petersburg, that is, Leningrad: the Tauride Palace, the Hermitage, the Smolny Institute, the cruiser Aurora, and a gala meeting at the Oktyabrsky Concert Hall, which can seat 4,000 people. We also have a similar program for Moscow: The Hall of Columns, the Kremlin, the Armory, and the Great Patriotic War Museum on Poklonnaya Gora. We expect some 150 delegations from 100 countries. I have prepared the program and would like to coordinate it with you. I hope you will approve it. We will host MPs from many countries. The best thing is that nearly all of them support us on the matters of Crimea and Donbass. These people have a positive opinion about us. 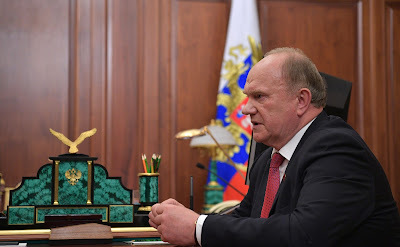 Leader of the Communist Party faction in the State Duma, Chairman of the Central Committee of the Communist Party of the Russian Federation Gennady Zyuganov. When do you plan to hold this event? From November 2 to 9, three days in St. Petersburg and three days in Moscow. The gala meetings in the Tauride Palace and in the Hall of Columns. The speakers are ready. By the way, they are very loyal to us despite the sanctions. We have met with them in Beijing, Hanoi and Strasbourg. We will also have delegates from Europe, despite the sanctions. The left-wing and center-left parties have a favorable attitude towards this matter. They do not fear the sanctions, and they will be happy to come. 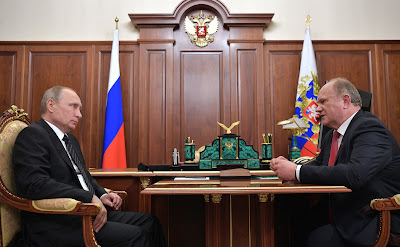 Vladimir Putin with leader of the Communist Party faction in the State Duma, Chairman of the Central Committee of the Communist Party of the Russian Federation Gennady Zyuganov. 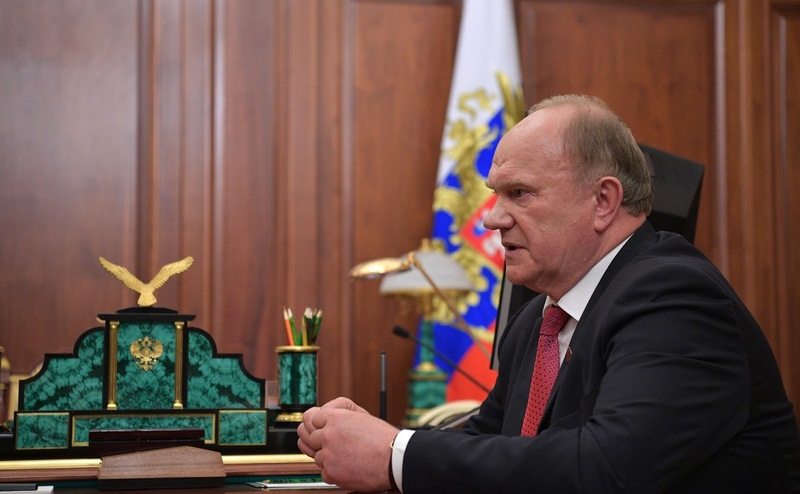 0 Comment to "Meeting with Communist Party leader Gennady Zyuganov"